As triathletes we are accustomed to some level of regular pain: the pain of waking up early, the pain of racing hard, the pain of running off of the bike on a muggy Tennessee summer's day...Naturally then we can assume that pain with training is part of the process, right? Wrong. I frequently see triathletes who come to me for treatment of an injury and eventually mention "a bit of shoulder pain", AKA a LOT of shoulder pain. Swimming may be the shortest part of the race, but ignoring discomfort with your swim stroke is detrimental to more than just your finisher's time. You could be training yourself towards rotator cuff pathology, labral tearing, bicipital tendonosis, subacromial bursitis, or arthritic degeneration. The good news is that a skilled assessment of your posture, strength, muscular flexibility, and movement pattern can effectively avert the aforementioned disasters. Our shoulders are extremely mobile and therefore less stable compared to other joints. For the purpose of simplification, we will use the analogy of a golf ball sitting in a tee; the golf ball is the shoulder head, or humerus, and the tee is the socket, or the glenoid fossa. Take a look at the very simplified anatomy image of the shoulder. Keep in mind that this does not include multiple structures, yet it still demonstrates how little space we have available between the humerus and the bony arch above it (the acromioclavicular arch). Further keep in mind that the four rotator cuff muscles, the latissimus dorsi, the long head of the bicep, and the serratus anterior all interact with the shoulder joint and function to keep that golf ball sitting squarely in the middle of the tee. If there is muscular tightness, weakness, or poor upper back posture the golf ball can sit too far forward, too far back, or even wobble about. This will decrease the space between the humerus and the acromioclavicular arch during active movement of our arm. Tendons can become irritated or frayed, bursas can become inflamed, and joint surfaces can wear inappropriately due to an altered axis of movement. Swimming can become not only uncomfortable, but downright painful. Try this simple little experiment- In the first picture, my handsome volunteer is demonstrating an exaggerated example of poor posture. His head is down, his pec muscles are tight, his upper back is rounded, his shoulders and forward and internally rotated, and his posterior scapular stabilizers (read: mid/upper back muscles) are in lengthened and weak position. 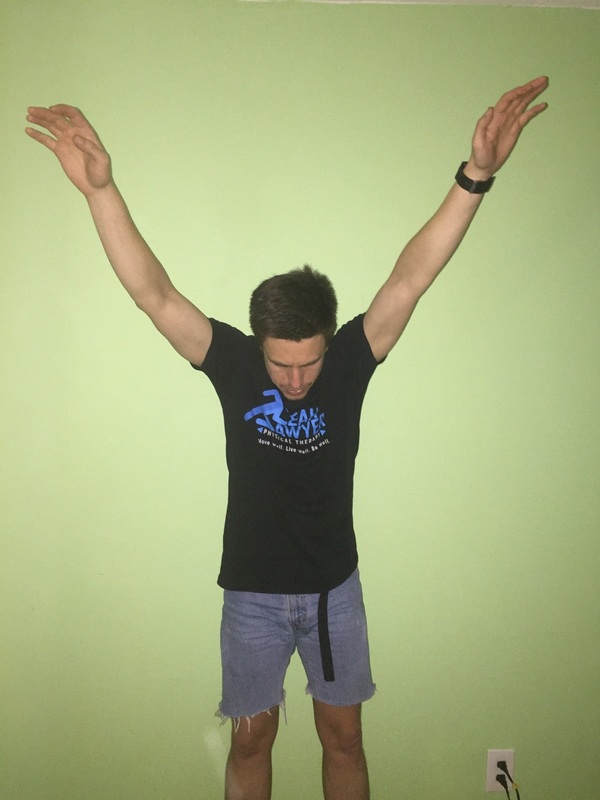 How far can he raise his arms up over his head? As I instruct Nash to hunch over and raise his arms as high as he can he says "but it hurts..." To which I respond, "yeah, that's exactly my point!" Side view. Wallace the cat is also participating in this demonstration, here. Nash can't raise far. Without even being prompted, he also notes that it feels terrible. Try it yourself! Do you feel uncomfortable pinching, d or downright pain with the motion? 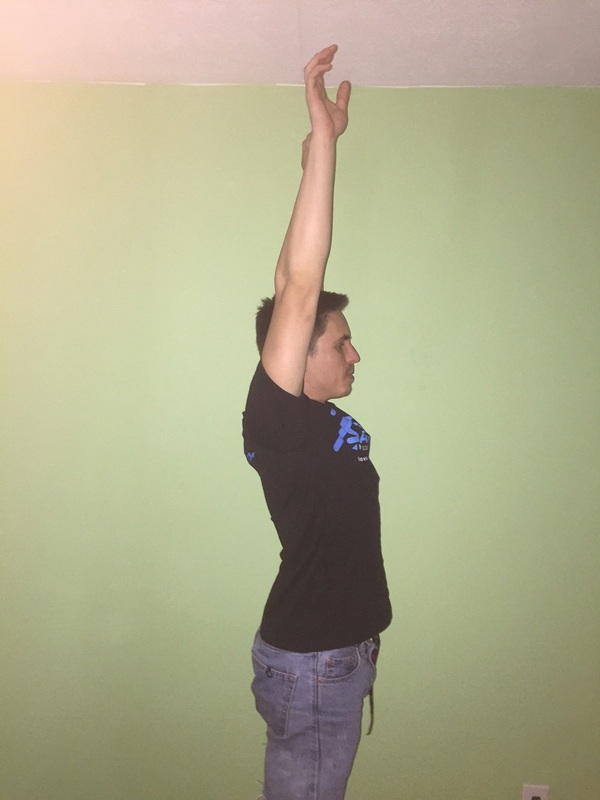 Now extend your chest, pull your shoulders down and back, and lift your head up tall. Now raise your arms as high as possible. See the different in motion? FEEL the difference in your shoulder? See how much happier Nash looks?!? Imagine performing repetitive motion (such as swimming, overhead lifting, or even getting dressed every day) in the first posture. Over time, that temporary discomfort will become downright painful and injurious. So what is the short summary of this detailed explanation? You need to get your golf ball sitting correctly in your tee, and you need to find why it is not doing so in the first place! If you suffer from shoulder pain, give me a call and we can talk golf. Or shoulders. Whatever.